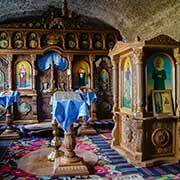 The small chapel in Orheiul Vechi Cave Monastery, carved into a massive limestone cliff. It was dug by Orthodox monks in the 13th century and remained inhabited until the 18th century; in 1996 a handful of monks returned and began restoring it. The chapel is part of the complex, which acts as a church for three neighboring villages, as it did in the 13th century.